A year after first taking to the skies, the doctors, paramedics, pilots and support staff are marking the 1st anniversary of the air ambulance’s inaugural rescue mission this July (22nd) and a positive first year in operation. The Charity, Air Ambulance Northern Ireland (AANI), in partnership with the Northern Ireland Ambulance Service (NIAS), provides the Helicopter Emergency Medical Service (HEMS) for the region and responds to seriously ill or injured patients, seven days a week, for twelve hours a day. The only service of its kind in Northern Ireland has seen the doctor/ paramedic team on the air ambulance work cohesively and successfully with the land crews from the Northern Ireland Ambulance Service (NIAS), and other emergency services to deliver advanced treatment and optimum care for patients. 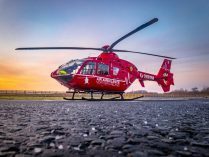 From July 2017 until 22nd June 2018, the air ambulance has been tasked to 380 emergency missions across Northern Ireland, providing critical advanced care to patients, with 50% of taskings being for road traffic collisions. Clinical Lead, Dr Darren Monaghan, said: “HEMS working alongside our road crew colleagues is able to attend patients critically injured as a result of major trauma, for example road traffic collisions, falls from heights, or serious agricultural injuries. Trauma unfortunately is the number one killer of people under 40 years of age and for every death there are at least two survivors with serious permanent disability. 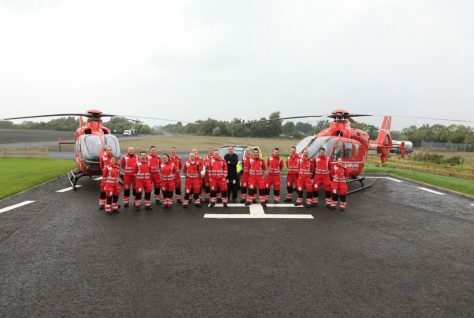 During the first year, our HEMS team have been able to reach hundreds of patients be it at the road side, farm yard or even the city centre providing clinical interventions and life-saving medical treatment at the scene and in the air. “We know that patients are alive today due to the care we provide in conjunction with the whole health service. We would like to say a huge thank you to the population of Northern Ireland for their support and donations which allow this lifesaving service to continue. Two of those who have visited the base are John McMullan, along with his son Conor (12), who was the first patient to benefit from the air ambulance service on 22nd July 2017. Air Ambulance NI’s anniversary celebrations are due to get off to a flying start with a BBQ at the base in Lisburn for Club AANI members. The charity is also using the anniversary to highlight how it requires £5,500 per day to keep this vital service going, meaning £2million must be raised each year. 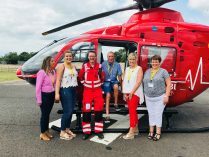 Kerry Anderson, Head of Fundraising for Air Ambulance Northern Ireland explains more: “We have come such a long way over the past year and are extremely grateful for the generosity and support of the people of Northern Ireland to date. Without this ongoing support and without much needed donations, we will be grounded and the service will not be able to operate. The charity is also gearing up for Air Ambulance Month in September, a national campaign which aims to recognise the work of air ambulances across the UK. The team at Air Ambulance Northern Ireland will be organising a series of fundraising events in major towns and cities across the region requiring volunteer support and briefings for local businesses who might like to support the charity and an abseil at Belfast Castle on 9th September. To find out more about the charity, how you can help fund a life-saving mission or to send Air Ambulance Northern Ireland a birthday donation, visit Air Ambulance Northern Ireland’s Facebook page, visit www.airambulanceni.org or call 028 9262 2677.